Apple, pear, banana, orange and apricot, harmoniously combined with chosen qualities of wheat flour, from specially chosen varieties of Greek wheat and milk, have been added to JOTIS Wheat Cereal with Milk and Fruits that provide your babies’ with high rates of energy, proteins, vitamins and mineral elements necessary for their proper growth. 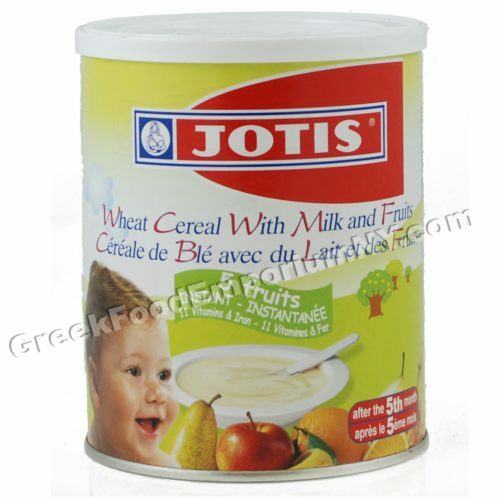 Made of wheat flour, milk and 5 fruits chosen one by one. The fruits help normal bowel function and digestive system. With wonderful flavor and aroma.